Read a Comprehensive list of Games Activities and Toys for two year olds. Below are some games designed for two year old kids. Keeping a two years old engaged is not easy and this list is compiled using real experiences and toys we have. The child’s second birthday is one with special significance for parents. There has been tremendous development over the past year. Now they are more mobile, have more strength, always full of energy and have lots of potential, thus can do many more activities they were not able to do earlier. Now most of them run with little or no falling. They can also negotiate stairs alone, both up and down, some even without holding on to the railing. When interested in looking at a book, they can turn the pages singly. Thus, you may be looking for the games, activities and toys for your two year old kid as he is growing and want him to learn new things and want to use his energy and potential in a positive work. If you are looking for some baby games then below is a compiled list of some great games, activities for 2 year old and toys for two year old kid. A two year old kid can kick a large ball upon request without demonstration. Don’t take very large and hard ball for your kid it may hurt him. Take a small and less hard ball. This is good game for kids of this age as their muscles are growing they need to exercise to make them stronger. Take your kid to the park there he will get the space and the environment. You can ask your kid to chase the ball and kick it. The running and kicking of ball will improve his Gross Motor Skills, at the same time will improve your kids decision making capabilities as he needs to focus on ball and kick it with full force. It is a good exercise for his legs. This is a wonderful game you can play with your kid. All you need to do is get all his small toys and stuff like crayons, pebbles, blocks, small cars etc. Keep them in a container and sit along with your kid. Then ask him to share the stuff. While playing keep repeating “One for You” , “One for ME” as he alternates between placing one object on his plate and one on yours. You may need to show him what you want him to do at first. Then you can ask his toddler friend or just keep a teddy and ask him to share the stuff in three ways. Not only does it teach him how to share, it also helps introduce to him to numbers if you count how many objects each player has at the end. Now there are various types of indoor basket balls options available in the market. You can attach the board and the net on wall (as per the height of kid) and show him how to play a basketball game. He will love to throw a ball in the net. To motivate him you can applaud or give him cookies each time he did a goal. This game helps in the improvement of kids’ hand eye coordination and height. Kids start learning the concept of focus and goal through this game. Create a virtual pool at your home may be with carpet or mattresses. Pretend as if carpet is the pool and your toddler has to reach the other side of the room without getting his feet wet. You can place magazines, newspapers or paper plates across the floor as stepping stones. A fun and physical game, it will also help him improve his balance. Begin by calling out simple commands such as “Mumma says, put your hands on your cheeks” and showing your toddler what to do. The idea is to get him to copy you. Carry on with other commands, such as “Mumma says, put your hand on your chin” and “Mumma says, show your tounge”. Throw in some funny ones, too, like “Mumma says, say cheese” or “Mumma says, move your ears”, “Mumma says, thumbs up”. For older two year olds you could try to catch your toddler out by saying “Touch your toes”, without saying “Mumma says”. An excellent repetition game that’s great for teaching your toddler about different body parts. This is perfect game for kids. Building block is one toy that can be used by kids differently as they grow. So invest in good quality blocks. Ensure that they are big enough for your kid’s little hands and can be interlocked easily. Buy blocks with large number of blocks, bright colours and variety of shapes. Playing with blocks increases their fine motor skills and hand-eye coordination and also enhances their imagination skills. Blocks also teaches them to think logically. For e.g. as they grow they will learn blocks have to be placed in a particular way to make something out of them, this is a mental stimulation. And these skills are necessary for child’s intellectual development and improving cognitive skills. Not to forget that blocks also encourage creativity kids. The blocks that I have bought for my kid are Fisher Price Big Building Blocks . Kids of this age can solve puzzle of three or four pieces. You can get them knobbed puzzles as shown on the right hand side or simple card board ones. I personally feel that knobbed puzzles are easier to assemble. To start with buy puzzles of familiar objects like vegetables, fruits or animals. Involve your kid and show him how to join them. After regular practice your kid will start joining the pieces on his own and would love to solve the puzzle. This toy helps in the improvement of problem solving skills and memory. If you want you can also create your own DIY puzzles. If you have not yet introduced your child to shape sorting you can do that. There are various types of shape sorting toys available in the market. You can get them or can simply draw or cut the shapes and play with these shapes. Soon your kid will start recognizing the shapes. To make it more interesting you can cut the bread or chapatti in a particular shape like triangle or star. Your kid will love to have that and through playing you can also teach your kid about various shapes. As per my experience, kids start recognizing the shape “circle” first. The one that we have is from Fisher Price (see image above). I had got this when my son was one year old. He initially used it as basket and loved keeping everything inside it. Then slowly he started recognizing the shape of ‘Circle’ and one fine day he surprised me by sorting all shapes correctly. Just like that 🙂 .. The shapes above can also be used for stacking. So all in all its a good toy that I would recommend. You may start teaching the kids about the alphabets if he shows interest. Remember alphabets are not taught in schools to burden kids but because they are the basic building blocks of language. Being able to pronounce alphabets helps a kid in speaking clearly. There various types of alphabets recognition games available in the market. As per my experience the wooden board with alphabets is good for this purpose as kid has to fix the alphabet at the right place. Thus besides alphabets recognition kids start learning the right place of the alphabets. The wooden board or tray with numbers is good for this purpose as kid has to fix the numbers at the right place. Thus besides number recognition kids start learning the shapes and the right place of the numbers. You can also introduce your kid to counting in day to day chores and activities. For e.g. counting stairs when climbing it, counting number of cars when you are travelling, counting fingers and so on. I am using the Skillofun Alphabet and Number tray with my toddler for the past few months. The quality is good for the price (I had also got it in a sale) and its surviving well. This is one toy that I will definitely recommend for all two years old. I bought it for my son and my niece and they both love it. It keeps them engaged for at least half an hour (which knowing them is a great feat). Also great for travel. This practice board and refillable pen is good for introducing your kid to painting. And since the brush is to be filled with only water, there is no mess. The book let can be used multiple times. Again mine is surviving for the past few months so its very much worth the price. I first bought Mellisa and Doug Alphabet, then liked it so much that got numbers for my niece and Safari for my son. This toy promotes fine motor skills, and if you buy the one with alphabet and numbers then letter recognition and writing skills. Another toy that your 2 year old will love is doodle board. Its a magnetic board with magnetic pen for no mess fun. After writing something kids can erase it easily using the slider provided. My toddler loves doodling or scribbling on this board. This is another toy that I will definitely recommend. I had got a small doodle board from Mitashi skykidz so that it can easily fit in my hand bag when travelling. This another great way to engage kids when travelling. But there are many variety of doodle boards available from different brands. 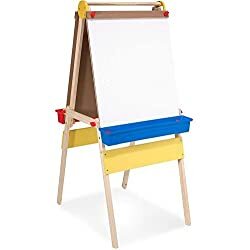 Another toy or learning resource that I would like to mention is Easel, magnetic Board and/or Green Board. These toys or rather learning resources can be used by your little one from two years to until they grow older. Initially they will be used for scribbling then writing alphabets and then words (if the toys survive that long) 🙂 .. I had bought Alpha Magnetic Learning board but the quality is OK and the magnetic letter along with them had magnets that are loose. So I will not recommend this particular brand and product. But otherwise investing in a magnetic board or a green chalk board is a good idea. 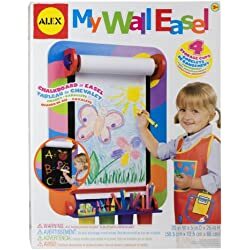 Some Famous Easel Boards are from Mellissa and Doug and Alex toys. Lacing toys are great for promoting good hand eye co-ordination and is great to keep hands and mind busy for 2 year old. This toy is also good for promoting fine motor skills. I have got this Skillofun butterfly sewing toy and happy with the quality. I also use the above toy with Skillofun Beads as the size of beads is perfect for the wooden needle. At 2 your child is ready for pretend play. So you can get him set of action figures and pretend play playsets so that he can play with them. I am not including any suggestions here as what you can get will be completely dependent on your child’s interest. What my toddler loves is a set of house, horse and molly (horse rider) that we got from mothercare store ELC section. Also my kid is in love with Leapfrog Scout as this can be customized to say your kid’s name and sings rhymes and talks (pre-defined sentences) as if a living thing. I had got this for my little one when he was 6 months old and is one of those toys who has still retained his interest. He loves pressing Scouts hands and listening to his favorite rhymes. Another type of toys that my toddlers loves is anything that he can stack and then make them fall. I am not sure but he seems to derive a lot of pleasure by first building things and see them falling. He has recently started loving this B kids Drop n Roll Bugs. I had bought this for him when he was younger but he did not show much interest but somehow after he turned two, he loves stacking these bugs and dropping ball and seeing it fall from top to bottom. There is also a music or a tone that plays when the ball falls. There are two balls in this set and the green one also has light. So its a toy in itself for him. I love the quality of B kids toys, they are tad expensive but the colours and feel is excellent. If you want you can buy this toy as this is good for hand eye coordination. Note – The links above are Amazon affiliate links. The reviews are genuine and not sponsored. Now let’s discuss some activities for two year olds. You can do these activities with your kid and these will help in not only keeping them busy but also will help in their overall development. As you kid is learning the shapes, alphabets, numbers and familiar about various other things around him, you can play this game with your kid. This game helps in the improvement of problem solving and thinking capabilities of kids. By now your kid may have started recognizing some of the basic colours. Usually kids start recognizing the bright colours first like Red, Orange. You can teach your kid colours while playing with balls or blocks. Keep showing him the colourful objects and repeat the colour name each time you show him some object. This is a wonderful activity to make your kids familiar with colours and art. Just take a paper and water colours dip your finger, hand or foot and leave an impression on paper and make whatever you want to make. The activity helps in the improvement of fine motor skills. Isn’t interesting we can make a painting with the help of vegetables we eat!! Onion and lady finger are best vegetables you can make a painting with. Just cut the vegetables, dip them in a colour and leave an impression on paper. You can also try out stamping with your kids. This activity can be done using foam or wooden stamps available in market or you can make some stamps of your own using vegetable like Potato or foam. Sensory play is an activity that stimulates the young child’s senses like touch, taste, smell, see and hearing. Kids can be able to touch and feel and observe the real things. They are given a chance to explore a lot, know about scientific processes. With sensory activities Toddlers and preschoolers get the chance to investigate and play. You can create a sensory bin for your child and let him explore. I started singing rhymes for my kid when he was just 3 months old. It may sound funny but yes, instead of lullaby I preferred to sing rhymes for him. Through rhymes they get aware of many new words and they also like the rhythm of rhymes. To make it more interesting you can use some props and can act while singing rhymes for your kid. Trust me, try this your kid will love to hear rhymes in your voice. Would love to share some of the favourite rhymes of kids. Books are the best friends and best companion. Books play very important role in everyone’s life. You should read for your baby. That is the best time when he listens you and try to understand the world through your voice. It is the best way to spend a quality time with your kid and through stories he can connect himself with real life situations and can learn life lessons too. To make this time more interesting you can use some props or act, while reading a story for your kid. For a better understanding please have a look on Reasons why you should read for your baby.